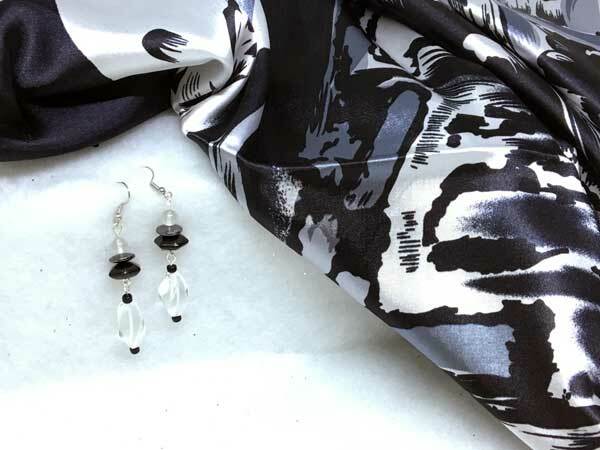 This 100% silk scarf is beautifully soft and luxurious. It measures 34 inches square, for lots of styling options! This one has a black border and a modern print in black, white and grey. The earrings hang 2.25" from the finding loop. The top has a hexagonal black onyx, topped with a hematite disc and a rock quartz round. Dangling below that is a beautiful twisted, rock quartz surrounded by 2 black seeds. This set is an incredible deal for the gemstones in the earrings alone. Sometimes, when you've been given a good deal on gemstone pieces, you pass that good deal on to others. Enjoy!